Akhila is a passionate beauty industry student and digital media associate at Skin PS Brands. She is a recent graduate of the Beauty Industry Merchandising and Marketing major, and is continuing her education at the Fashion Institute of Design and Merchandising (FIDM) pursuing her Bachelors of Science in Business Management. 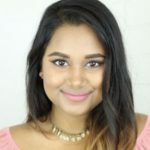 Through her experience in various beauty internships and assistant positions, Akhila has acclaimed a background in digital marketing by content creating for social media, as well as, traditional marketing by maintaining relationships and pitching to editors and broadcast for brand placements.